Masbate City anti-illegal drugs unit swooped down a private residence yielded suspected meths and drug kits. 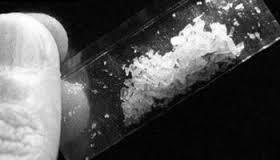 Legazpi City, [08.30.18] – A house caretaker in a residential house in Barangay Ibingay, Masbate City was arrested by virtue of a warrant of arrest for illegal drugs and illegal drugs paraphernalia on Wednesday evening, a police report said. According to the report reaching Camp BGeneral Simeon A. Ola, a service of a warrant of arrest issued by Honorable Judge Teofilo B. Tambago of Regional Trial Court, Branch 46, Masbate City was implemented against Jose Denmark Banac y Bacolod a.k.a. “Banak”, 37 years old, single, caretaker, a resident of Barangay Ibingay at 6:35 o’ clock in the morning of August 29, 2018. The City Drug Enforcement Team [CDET], Provincial Drug Enforcement Team [PDET], Regional Drug Enforcement Team [RDET] and Investigator Agent 1 Dennis M. Benitez, the Masbate PDEA Provincial Officer in implemented the search warrant No. 39-2018 for Violation of Republic Act 9165. The lawful search has resulted has resulted in the recovery of the following items inside the were three pieces of crumpled aluminum foil with residue of suspected “shabu”, one piece small box containing three pieces heat-sealed transparent plastic sachet with suspected “shabu”, one-piece plastic container containing two pcs heat-sealed transparent plastic sachets with suspected “shabu”, one piece matchbox containing three pieces heat-sealed transparent plastic sachet with suspected “shabu”, one-piece plastic container with alcohol and wick used as improvised burner, one piece green disposable lighter, one piece bottle cap with residue of suspected “shabu”, one piece of forceps, one piece surgical blade, one piece plastic containing pieces of broken glass tube, one piece glass tube with rubber used as improvised totter with residue of suspected “shabu”, one piece red straw with suspected residue of “shabu” and one bottle containing several plastics with liquid believed to be “shabu”. The suspect is now facing a charge for violation of Article II, Section 11 of Republic Act 9165.